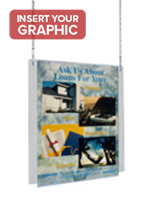 These poster frames are hanging displays that hold 24" wide x 36" high art prints and pictures. 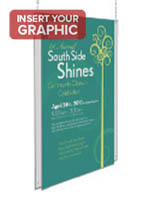 The material is non-glare acrylic to ensure the signage is clearly seen in both dimly lit and bright settings. 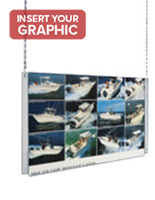 The poster frames are sold with a complete hardware kit that includes two 10' lengths of metal chain, four metal S-hooks, and metal ceiling clips. 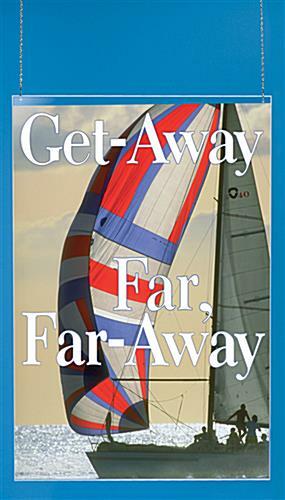 Use to showcase special events, clearance sales, and new arrivals. They can even provide valuable information to customers such as the location of the rest room, fitting rooms, or checkout counters. 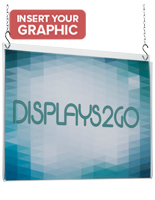 While ideal for retail settings, these acrylic frames are also found in professional buildings as directional signs.